Don your swimsuits and don't forget your factor 40: during this city-to-seaside metamorphosis (on the quays below Hôtel de Ville) sun gods laze by the Seine on (France's tiniest) beaches; under the shade of fake palm trees, rollerbladers, cyclists and walkers have free run of the river banks, and kids play with water games dotted along the quays. 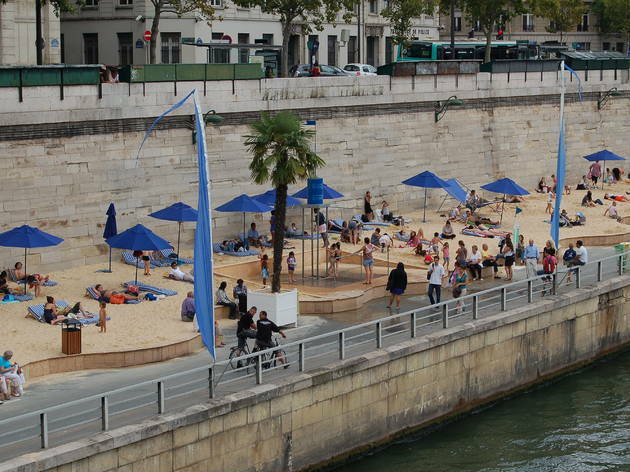 The sucess of the Seine's urban beach has also enabled the event to spread into Paris' 19th arrondissement, along the Canal de l'Ourcq at Bassin de la Villette (Métro Jaurès). 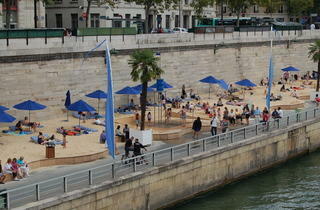 Here you can go kayaking in the canal, play boules, and laze in cafés all along the water's edge. Free music concerts are held at both beaches, many by France's best emerging groups.